Respiratory care and physician assistant studies students participated this winter in a program designed to foster interprofessional clinical training while creating health plans for homeless families. 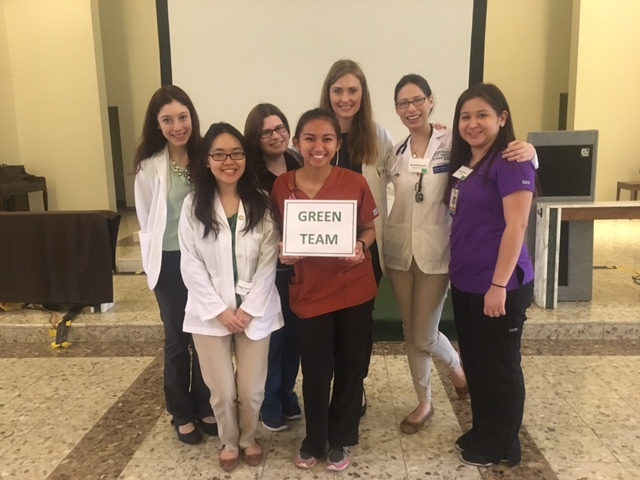 The RESPECT program (Realizing Enhanced Student Inter-Professional Education through Clinical Teamwork) brings together medical, dental, dental hygiene, nursing, pharmacy, respiratory care and physician assistant studies students. Using on-site student-run medical and dental clinics, students work in teams to assess the health and wellness of families at the SAMM (San Antonio Methodist Ministries) Transitional Living and Learning Center (TLLC), a homeless transitional center, said De De Gardner, associate professor, chair of the Department of Health Sciences and the Steven Lloyd Barshop Endowed Chair in Respiratory Care. Students spend their first of five sessions in a team-building exercise and their second session learning about the SAMM TLLC and the families there. The third and fourth sessions involve meeting as a team with families to perform health assessments and ultimately craft a health plan for each family assessed. Linda Abad, a second-year physician assistant student, recalled her team’s session with a mother and her 15-month-old son. “It provided such a good learning atmosphere not only for ourselves but also for our patients,” she said, adding that she signed up for the program to help meet the health care needs of the underserved homeless population. The fifth session included a presentation reflection from students about their experience. Brent Shriver, associate professor amd academic coordinator with the Department of Physician Assistant Studies, said the program provides an opportunity for students to learn about other professions and their role in the treatment of patients. RESPECT was established six years ago by Dr. Taline Dadian Infante, Ph.D/, RDH, and Dr. Anthony Infante, M.D. Asthma education materials were supported by the Chest Foundation Grant.